The Suomi NPP satellite captured this infrared image on Sunday (Sept. 10). Strong thunderstorms are visible around the well-defined eye of Irma. As Hurricane Irma winds down — and a message from a Florida sheriff – saying that shooting guns at the storm would not turn it aside — brings to mind the question of why we can't control hurricanes. The short answer is that we can't control weather at any scale, and hurricanes are no exception. "We have no real idea how to control weather in the sense of a hurricane," John Moore, a scientist at Beijing Normal University, told Space.com. "All that realistically can be done is changing the thermodynamics of the system, which largely means changing the sea-surface temperatures." Some of the more conspiracy-minded web sites have posited that Irma was the result of government experiments. The problem with that idea is that there isn't any realistic way to control weather with satellites, Moore said. 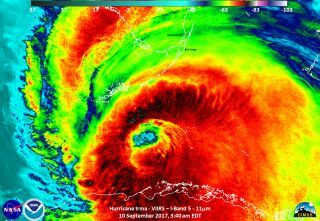 Reducing the ocean surface temperature would cut down the number and intensity of hurricanes, but "there is no physical model of how hurricanes evolve from birth, models are statistical generated, and the same with the tracks they follow," he said. Such a generalized model would be needed to control hurricanes. The closest thing that anyone has come up with is to surround the Earth with mirrors or shades that would reflect away light. Various proposals have been floated over the years — James Early, in the late 1980s, proposed such an orbiting shade that would sit between Earth and the sun at a stable point between the two; he estimated it would cost $10 trillion. But that would just lower the temperature; it wouldn't offer direct control of hurricanes. Many people have heard of seeding clouds to make rain; there are companies that do it, notably Weather Modification, based in Fargo, North Dakota. Even that, however, is imprecise. A story in Bloomberg in 2015 cited studies that showed cloud seeding increased snowfall from 5 to 15 percent. Rainfall is harder to measure exactly, but seeding clouds remains an uncertain business, according to the scientists quoted by Bloomberg. Hurricanes, in any case, occur over a much larger area than the rain clouds that a plane would seed. Meanwhile, besides using satellites, spraying sulfur aerosols in the atmosphere might be another method of reducing ocean temperatures. Moore said that that is the best-understood method, and there is some data to show sulfur might cool the planet down, since that's what happens when really large volcanoes erupt. NASA's Earth Observatory noted in 2001 that global temperatures dropped by 0.6 degrees Celsius (1 degree Fahrenheit) over about 15 months after Mount Pinatubo in the Philippines erupted in 1991. That won't control a hurricane, though. Meanwhile, there's the possibility that the sulfur aerosols will come back to the ground with rainfall, and the effects of that are unpredictable, though the amount of sulfur used would be dwarfed by what's emitted by power plants, Moore said. Could a satellite create a hurricane? Not with current technology. According to NOAA, hurricanes form when the ocean surface is heated by the sun in late summer. To do the equivalent, one would need some way to get energy to water -- perhaps something like a huge laser or microwave generator. Further, it would have to be spread over a very large area. Even a billion-watt laser would be very weak when the beam is spread over hundreds of square miles, and an array of lasers would require hundreds of satellites. To keep hurricanes manageable, Moore said humans will probably just have to reduce carbon emissions or get the carbon dioxide out of the atmosphere. "There needs to be active removal of CO2 from the atmosphere as well as declining emissions," he said. "That is crucial for our survival as a civilization. Geoengineering is just an emergency method, e.g., to prevent collapse of the ice sheets raising sea level several meters, or large numbers of heat deaths and depopulation of regions such as the Middle East. A few hurricanes are fairly small beer in comparison with those issues — though obviously catastrophic for those affected."